“[Annie Daugherty] was the midwife of the entire town. She delivered most of all the children in [Black Mountain] for the people who couldn’t afford to go to the hospital or have a doctor no matter if they were black or white. That was my grandmother,” Katherine Daugherty Debrow told a local filmmaker in 2001. 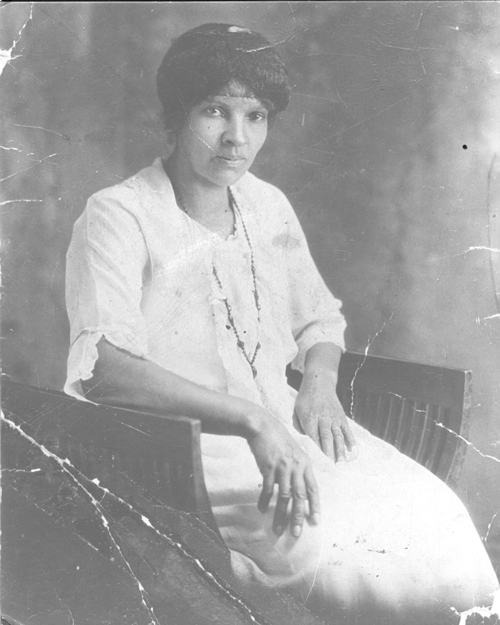 An African American woman working and raising her own children in the early 1900s, Annie Daugherty provided vital services to mothers in the Swannanoa Valley who otherwise may have had to go through childbirth alone. “I remember stories about her being gotten up in the middle of the night in snowstorms and riding mules and everything else to go to a house to deliver babies,” Katherine continued. Born in the High Top Colony community of Black Mountain on April 3, 1888 to parents Robert Morehead and Hannah Carson, Annie Morehead became part of the Daugherty family around 1900 when she married an older man from her neighborhood, Benjamin Daugherty. The Daughertys have been a presence in the Swannanoa Valley since its beginnings, and the Daugherty name shows up in the valley as early as the 1850 census, but also on early land grants and in the 1858 upper Swannanoa tax scroll. The first African American Daughertys most likely came to the valley as slaves in the late 1700s or early 1800s, but records dating back to that period, especially records of African Americans during the 18th and early to mid-19th centuries, are difficult to track. Ben’s mother, however, according to oral tradition, was a slave of a Caucasian Dougherty family in the valley at the time of his birth. In 1920, Ben was 70 years old, and he and Annie, who was less than half his age, had seven children—the oldest, Lillie, was 19 and the youngest, Charles, was 5. Annie was well known in the Black Mountain community not only as a midwife, but also as a Sunday School teacher. The neighborhood children would meet at her house on Sunday mornings to walk with her the two miles from High Top Colony to the church. Annie’s dedication to the community’s children and mothers made her highly respected within the town. “I can remember going into Black Mountain when I was a little girl,” Katherine Debrow began. “And people that she had delivered babies for, they would always give me money: pennies, dimes, nickels, quarters. I would come home and I’d have two pockets full of money.” Katherine continued, “And they called her Aunt Ann, black and white,” explaining that calling someone who was not a relative “Aunt” or “Uncle” was a sign of respect. The hospitals that admitted African Americans were located over 15 miles away in Asheville, and thus were used little by black women in Black Mountain. Though there were a multitude of white doctors in the valley at the time, and Annie was delivering babies during the Jim Crow era, she also attended to white women. Inez Smith Daugherty (1912-2007), Annie’s niece, explained that she only remembered two midwives in Black Mountain—Annie and another woman, Mary Hayden. Both Annie and Mary were black, so for folks—black or white—that couldn’t afford a doctor or didn’t have the time to make it to one, Annie or Mary made house calls regardless of the time of day, weather, or race of the mother. But in the 1920s, state governments began to require midwives, who had traditionally been trained in the craft by one of their female relatives, to get permission slips from doctors to practice, have their homes inspected for cleanliness, and have their moral character assessed. Around this time, the government also began to ban the use of herbs and poultices traditionally used by midwives, severely handicapping what relief midwives had been able to offer their patients. These new regulations disproportionately affected African American and low-income families. But Annie continued her practice. She began frequenting the town pharmacy for a tincture of opium called paregoric that eased the pain of childbirth. Sadly, on March 28, 1959, as restrictions on lay midwives continued to debilitate the traditional practice, Annie Daugherty passed away in a tragic house fire that also took the life of her son, Benjamine. By 1970 lay midwifery had been outlawed completely, thereby severing many of the strong bonds that had been built between the town’s two African American midwives and the women—black and white—in the community. Now women were forced to pay the steeper prices for doctors and midwives had to attend modern licensing courses or give up the traditions they had been practicing for generations.